Observed near Eldoret, Kenya, Kenya. January 2014. 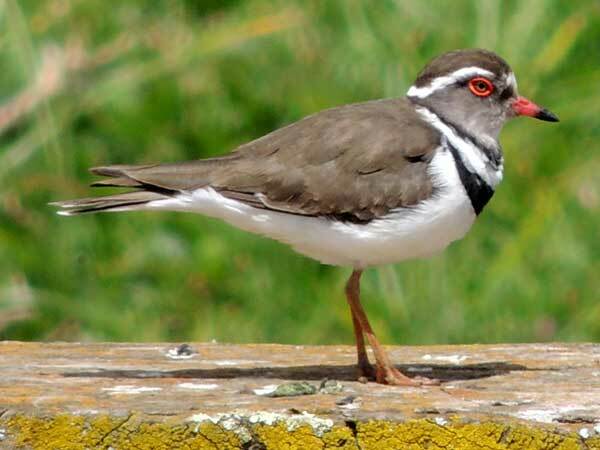 From Wikipedia: The adult Three-banded Plover has medium brown upperparts, and the underparts are white except for the two black breast bands, separated by a white band, which give this species its common and scientific names. The head is strikingly patterned, with a black crown, white supercilia extending from the white forehead to meet on the back of the neck, and a grey face becoming brown on the neck. The eye ring and the base of the otherwise black bill are red.